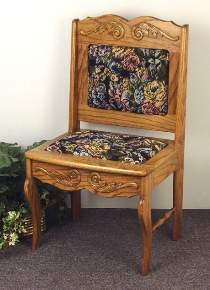 Companion project to our upholstered hall bench, this hall chair provides a convenient place to sit and remove shoes or boots. Straight back design economizes valuable space in your hall or entryway. Instructions show how to add upholstery for extra comfort. Chair measures approx. 35”H with 16” seat height. Order two 11” spindles and embossed wood ornaments separately below.